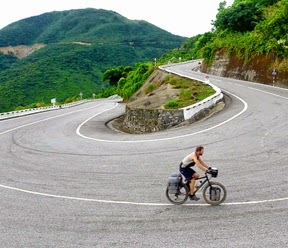 Accompanied by your tour guide, you commence the day leisurely cycling along country roads witnessing local Vietnamese rural life first hand and then continue on to discover many beautiful photo opportunities. You will visit a traditional organic vegetable village where you must be prepared to get some mud on your hands! Learn how to water and plant the vegetables, turn soil with a local farmer, ride a water buffalo in a rice paddy field, see many local ducks swimming along the rice farm and meet farmers tending to their crops. Later you will board our boat for a river cruise to meet and engage with local fishermen and enjoy a hands-on experience of traditional net fishing. At the local fishing village you will get the opportunity to float along the coconut palm lined waterways in a unique Vietnamese bamboo basket boat. Your tour guide will explain to you the extreme conditions endured by soldiers on both sides of the Vietnam War along this landmark. Back on board our boat, you will be invited to dine on a traditional lunch accompanied by a beer or softdrink before boarding the bus or coach that will return you to your hotel. This tour provides you with a cultural window into the ways of life of both our farming and fishing communities. Meeting point: A tour guide will come to your hotel with bicycles for you to ride to the starting location. Please inquire about an alternative bus pick-up option. You will be returned to your hotel by bus/coach. Tour type: Suitable for all ages and fitness levels. Please note: A surcharge applies for private tours. Drop off to your hotel at tour’s conclusion. Lunch (with a beer or softdrink). Boat cruise and basket boat hire.